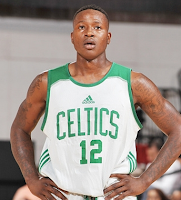 Celtics first round draft pick Terry Rozier isn't known as a three-point shooter, but he's demonstrated early on that he has the "clutch" gene (notice the score and time on the clock in each clip). Terry Rozier says that he has the "ultimate eye of confidence to take big shots." Micah Shrewsberry says the greatest lesson he learned about Terry Rozier this week is that "Terry is a warrior."